Timothy O’Leary teaches Philosophy at the University of Hong Kong. He has published widely on Foucault, especially in relation to ethics and literature. He is the author of Foucault and the Art of Ethics (2002, 2006) and Foucault and Fiction: The Experience Book (2009). Christopher Falzon is a lecturer in Philosophy at The University of Newcastle. He is the author of Foucault and Social Dialogue (1998) and Philosophy Goes to the Movies (2002). 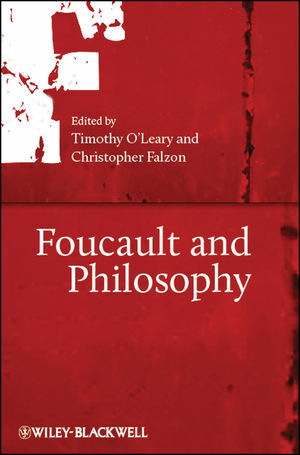 Introduction: Foucault's Philosophy (Christopher Falzon & Timothy O'Leary). 1 Foucault, Hegel, and Philosophy (Gary Gutting). 2 ""I am Simply a Nietzschean"" (Hans Sluga). 3 Foucault, Heidegger, and the History of Truth (Timothy Rayner). 4 The Entanglement of Power and Validity: Foucault and Critical Theory (Amy Allen). 5 Foucault, Davidson, and Interpretation (C. G. Prado). 6 The ""Death of Man"": Foucault and Anti-Humanism (Béatrice Han-Pile). 7 Foucault's Theory of Knowledge (Barry Allen). 8 Rethinking Experience with Foucault (Timothy O'Leary). 9 Foucault, Queer Theory, and the Discourse of Desire (Jana Sawicki). 10 Foucault and Normative Political Philosophy (Paul Patton). 11 Foucault, Philosopher of Dialogue (Christopher Falzon).